Let’s Welcome the New Year in the magic lights over the river !! 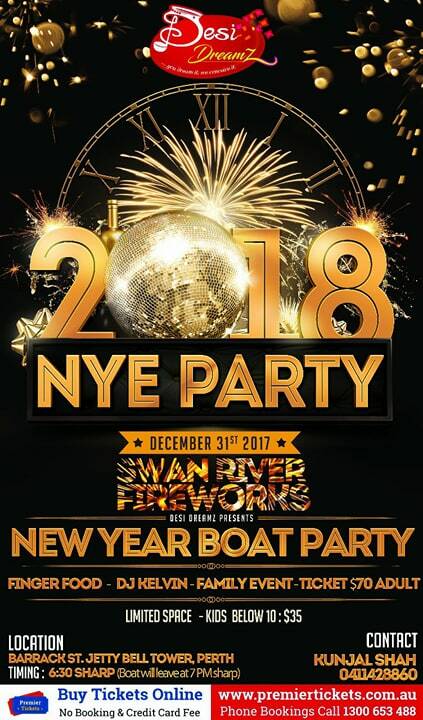 DESI DREAMZ Presents New Year Eve boat party on 31 Dec.
We hope to see you there! Our party is open to all who love to have a good time. Bring your friends along as you’re in for a time to remember. SWAN RIVER FIREWORKS for the first time !! Non-stop entertainment all night long!!! Non-sense activity will not be accepted and the people involved in it will be drop off from cruise straight away. NO REFUND will be provided. Premier Tickets Australia is proud to be the online ticketing partner for New Year Eve @ Barrak St Jetty, Perth.